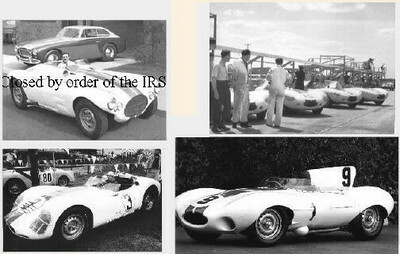 In 1956 the IRS noted that Cunningham Motors had consistently failed not only to win Le Mans, but to make profits. They declared it a hobby rather than a business, and closed it down. Just as this was playing out, Sir William Lyons of Jaguar, sensing that he could eliminate a nagging challenge, invited Cunningham to close shop and join Jaguar. A combination of pull and push left Cunningham with little choice but to become the Jaguar distributor for the US East Coast. And so he became a car dealer, and can be credited with much of Jaguar's marketing success in this area during the 50's and 60's. As a reward, Jaguar gave him the newest and best D-Types for his racing stable. By this time the team included master mechanic Alfred Momo and a who's who of 1950's race drivers, including the fast and furious Walt Hansgen. The Cunningham team travelled up and down the East coast, showing them how it was done.